Today, pesticide toxins are nearly impossible to avoid. We live in a world where our pets unknowingly are exposed to harmful levels of toxins everyday [pesticides in food, grass and soil, drugs and chemicals in their water supply, steroid and hormone residues, preservatives, air pollution, adulterated oils and additives from food processing, genetically modified organisms, fungus…, and chemicals found in homes, carpets, plastic toys and food dishes]. Pets face increased exposure to toxic chemicals since they have limited diets, play and sleep on the floor, walk “bare-pawed” on chemically treated grass and streets, and groom themselves regularly with their tongues! These toxic substances accumulate in your pets, and their little bodies aren’t equipped to handle the overwhelming contamination levels from modern toxins that are steadily reducing their quality of life. Detoxification of your pet is no longer a luxury. It is a necessity. Fortunately, Nature hasn’t left your pet without a way to accomplish this. 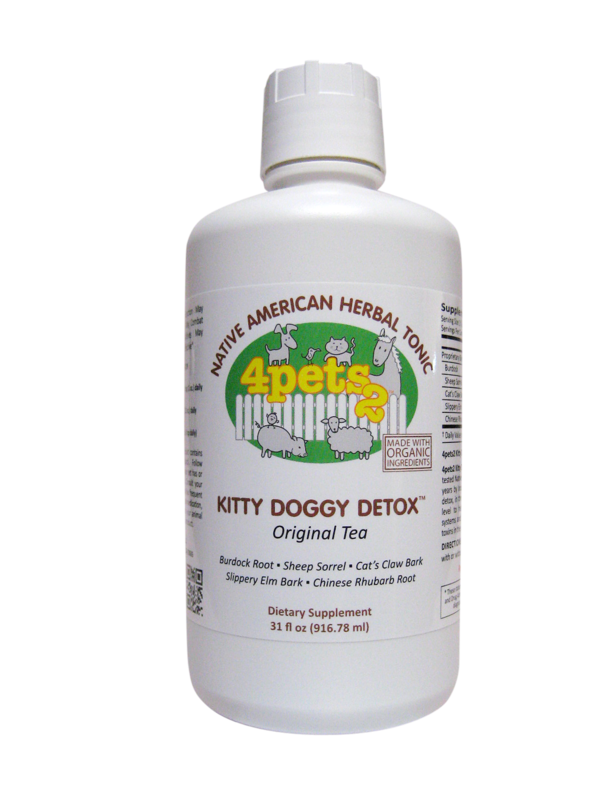 This specific combination of herbs is in a “league of its own.” Unlike most commercial herbal supplements, KITTY DOGGY DETOX™ is produced in small, limited quantities. The herbs have no pesticides and are certified organic. We have these incredible herbs produced in pristine parts of the world that are ideal for each herb. There is limited worldwide supply of this level of herbal excellence. Surprisingly, when it comes to herbs, the exact place they are grown makes all the difference. After harvest, the herbs are dried and blended to our specific formula. Cats and dogs were contaminated with 48 industrial chemicals, including 43 chemicals at levels higher than those typically found in people. Dogs were found to have 2.4 times higher levels of PFC’s (Teflon chemicals) than found in humans. Cats were found to have 23.4 times higher levels of PBDEs (fire retardants) than found in humans. 11 of the toxic chemicals found in dogs were carcinogens. Cancer rates in dogs are much higher than in people – including 35 times higher rates of skin cancer and 8 times higher rates of bone cancer. 20 – 25% of dogs die of cancer, making it the second leading cause of death in dogs.